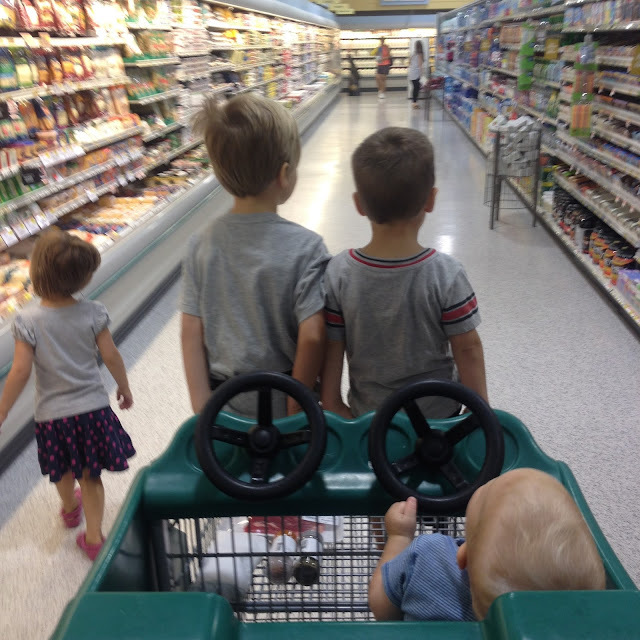 A few people have asked me how I get my grocery shopping done now that I have three little ones in tow. If I were a smart mama I'd probably just go to the store on Saturday or Sunday with my most docile child while B Daddy watched the others. But I'm extremely protective of weekend time with my man - I hate wasting a precious hour doing something like grocery shopping....so I've developed a system that enables me to go to the store with all three precious darlings. It's working for now. I'll report back in a few months or a year when things change. We park the car (same aisle every time) I unbuckle the 3 year old, stash my infant in the Moby Wrap and grab the 2 year old (my runner/least predictable child) last. We slowly make our way into the store and grab the only acceptable race car cart. Not the one with the loose steering wheel or the one with the broken buckle. Grab either of those carts and my children will LOSE THEIR MINDS. Once seated, both toddlers steer their hearts out while I navigate the unwieldily cart down each aisle. Did I mention all children went to the bathroom/were fed/got fresh diapers before we left? Critical component. I maneuver the race car around the store adhering closely to my list for the week. Along the way I will pick up my keys (dropped by the two year old) six times, re-buckle the 3 year old twice, reprimand the two year old for standing up in the cart once and remind myself of Rule #2 constantly. As I was reaching for my turkey, not five seconds later, I heard a shriek of, "He's getting her! He's getting her with the keys!" from deli lady. I turned to see my eldest standing up and pummeling Sweet B with my car keys. On another day I might have merely threatened to take away their blessed cookie yet again, but on this particular day I had an audience. Had we not been surrounded by a dozen on-lookers with gape-mouthed stares, some hineys would have been hurting then and there. Yes my children would like a balloon! How thoughtful. What color balloon? The only color you don't have at your register of course. Yes my three year old would like you to walk down to register 8 to grab a blue balloon, thank you. And sure you can push the cart out to my car! It's the mini-van (obviously). I'll just walk slightly ahead while you dodge the blue balloon my son is beating against your head. Hold up a minute! Need to grab the keys that my daughter just threw overboard! Yes, you can load the car up for me. Don't mind the double stroller taking up the entire trunk. I'll wrangle the kids into carseats in the meantime. Pay no attention to the screaming! -Big Smile- No tip? Are you sure? Well ok -see you next week!! The drive home is mercifully short. Once there, we all collapse from exhaustion and gear ourselves up for a repeat performance in just six short days. You are a super hero Katie...no buts about it. SUPER HERO! We all know that's not true at all. But it does feel like it for a few brief minutes as we pull out of the Publix parking lot. Completely ridiculous that you've gotten away with that for 4 years now. I actually relived this episode in the reading. I could hear the sounds and feel the panic with the eyes staring at us. Add a couple of kidos to the mix... yes five... Well, long time ago, we all grew up in our sane minds and you will too. "This, too, shall pass" was my motto for a long time. Each week they will get a little older, you a little wiser and in time (like then years...) it will be a breeze! Just think of life without these sweet people and it makes it all worth while. 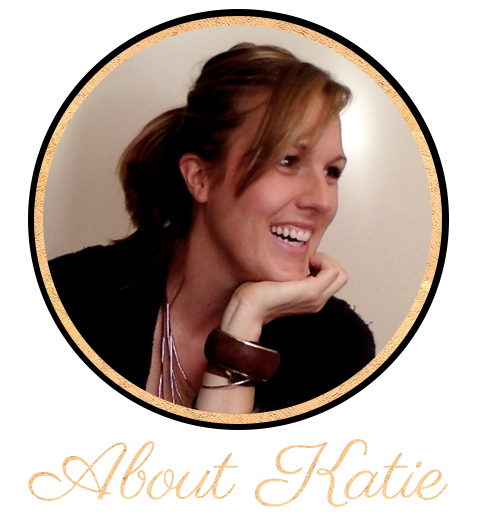 Katie, you are a SAINT! and a super-hero! I was about to die laughing by the time I got to the end. You do have a knack for telling a story! Will call you soon about coming to see you all. Doh! Knew I had the acronym for Dept. of Family & Child Services wrong...thanks for the correction! And yes we absolutely need to get together before I have my fourth child. am calling you this evening about what dates might work. thinking sometime this month. if you have a baby before then i will be equally surprised and impressed. Again, I don't know how you do it!